I’m so happy that spring officially arrives this week AND that I get to participate in another “Share your Mantel Blog Hop” hosted by my friend Amy at My Life From Home! 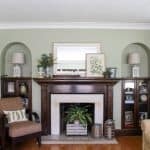 You’ll find links to lots of great spring mantel decorating ideas at the bottom of this post, so make sure to check them out! 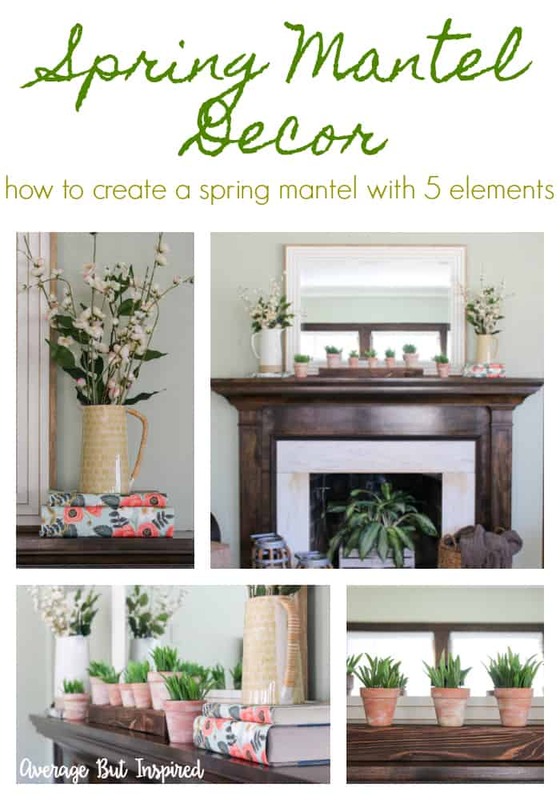 But before you do that, let me show you how you can decorate a spring mantel with just five elements! 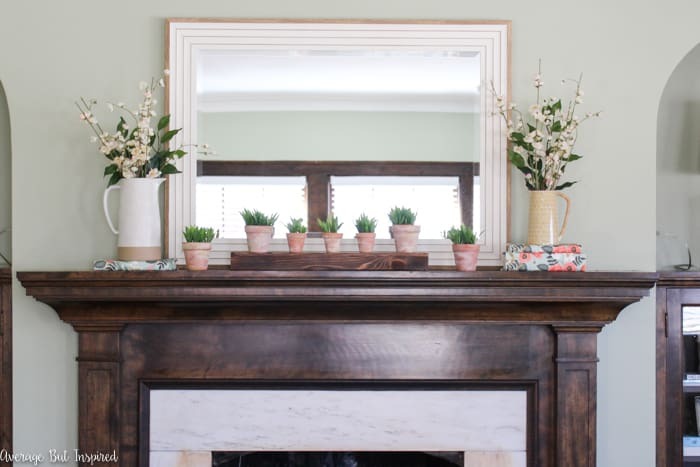 For my spring mantel decor this year, I decided to keep things simple and symmetrical, which is a little different than last year’s spring mantel (which you can see right here). I only used five types of objects, which made decorating a snap! I love this paired down approach. 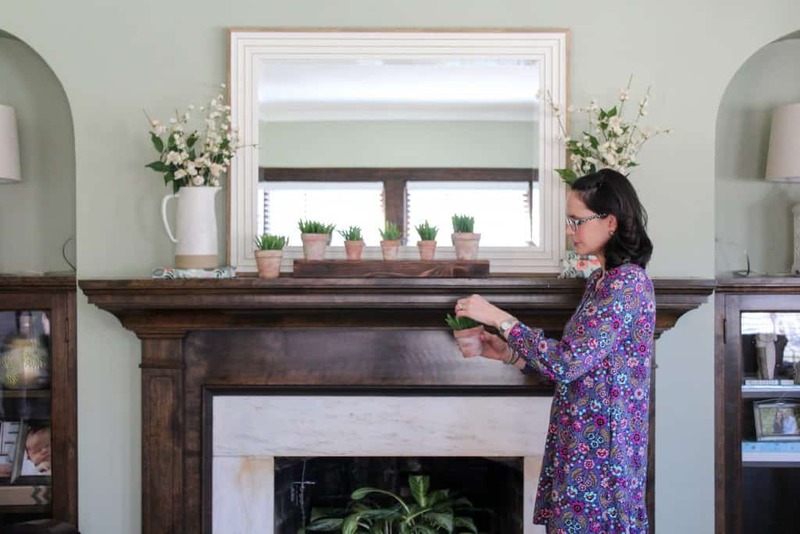 So what are the five elements in my spring mantel? Faux cherry branches and faux grass (both used in last year’s spring mantel) bring the “nature” to my mantel. 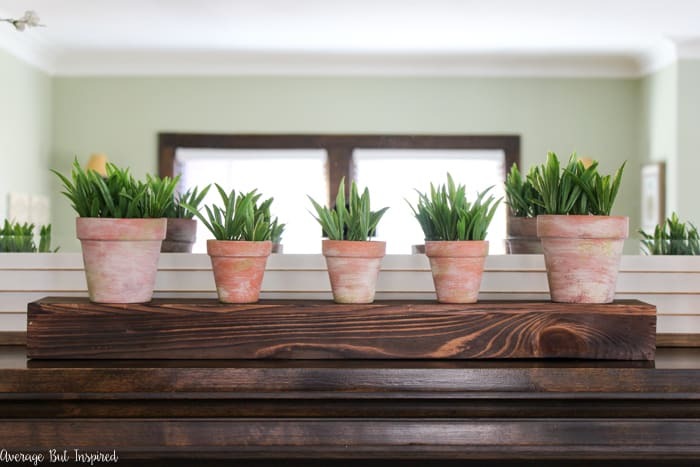 I stocked up on inexpensive terracotta pots and then gave them an aged look with paint. I set them on top of this upside down planter box (that I used in last year’s spring mantel) to give them a little height. But had I purchased larger terracotta pots, I wouldn’t have needed this extra height from the planter box. Watch this video to see just how easy it is to instantly age terracotta pots for a more interesting look! 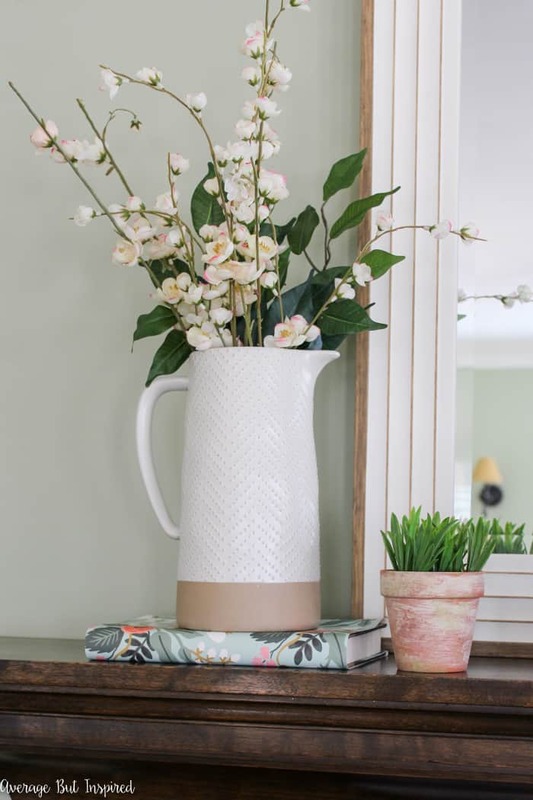 Ceramic pitchers have recently worked their way into my decor-loving heart. Of course I love them for pouring lemonade, but I also love them for holding flowers and greenery! I have used this adorable one from Magnolia’s Hearth and Hand line at Target on previous mantels, but this cute yellow one was a recent find from an unexpected place! I adore the color and the bamboo wrap around the handle! I grabbed a few books from the office and used them to give height to the pitchers. Notice how I used two underneath the smaller, yellow pitcher to bring the cherry branches up to the same height as the ones in the cream-colored pitcher and give a balanced look. I’ve used regular books on my mantel in the past, but for this spring mantel I decided to cover my books in beautiful wrapping paper. 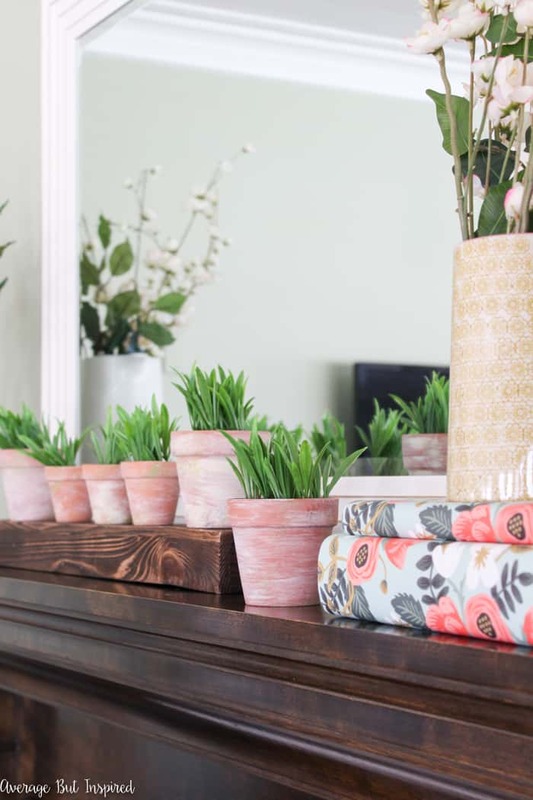 I purchased a roll of this paper and am happy with the color and floral details it adds to my simple spring mantel! 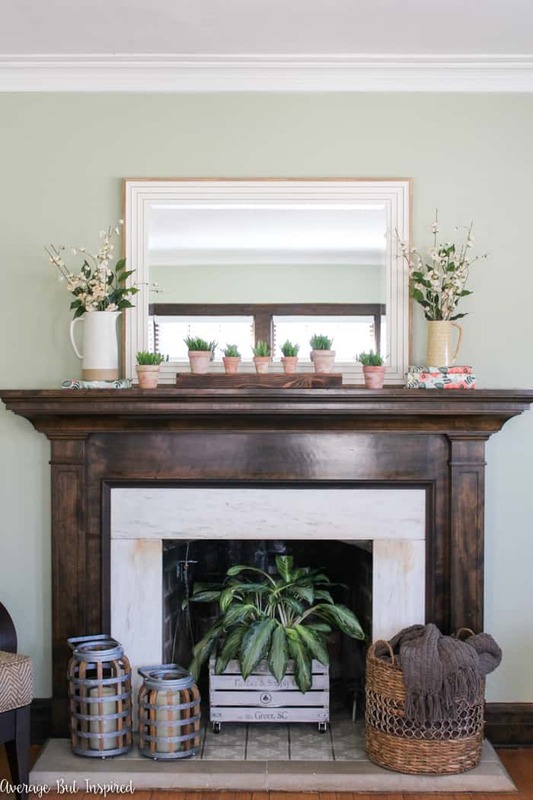 So there you have it – with just five main elements I was able to create a pretty spring mantel in hardly any time at all! If you like any of the items I used on my spring mantel, you can shop for them here by clicking any of these photos. Now that you’ve seen my spring mantel decor, I hope you’ll visit my friends’ posts to see their ideas for spring mantel decorating, too! Cheer Up Your Space With a Tin Can Vase! 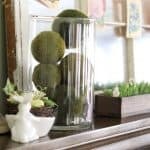 Hi Bre – beautiful spring mantel and fantastic decorating tips. We especially love the tips for adding height and the wrapping paper wrapped books! Happy Spring friend! I love all 5 elements you used for your beautiful mantel, Bre! Those pitchers are so pretty along with those painted pots. I’ve always loved the floral prints from Rifle Paper Co. Enjoy spring, my friend! Wow, I love this all!! Wrapping paper – you’re a genius! love how simple this space is but it still feels so very spring! so pretty. I LOVE your mantel! The symmetry and simplicity speak right to my heart. 😉 The floral paper around the books is genius! 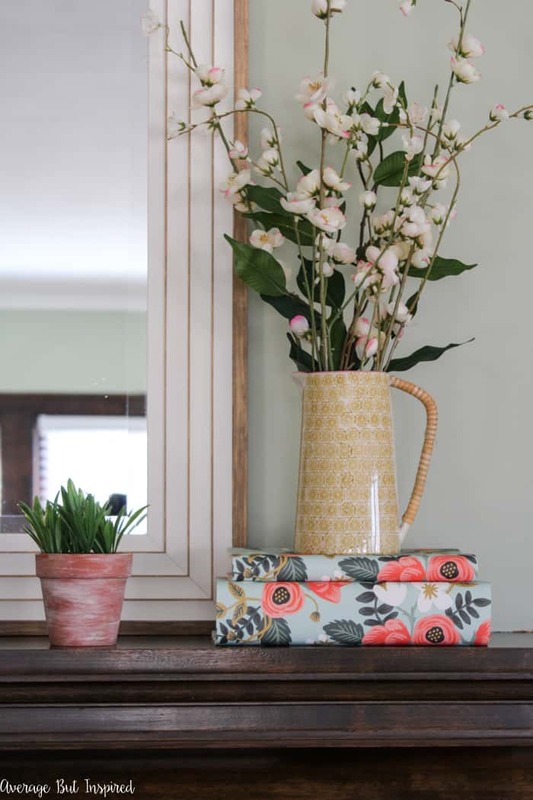 I am now on a mission to find some pretty spring paper to wrap my books in! What a pretty Spring mantel. I love how you wrapped the books and the pitchers are so pretty. Great video on the clay pots too! I love that you wrapped your books with wrapping paper~ Genius! It is simple and so beautiful. It is a perfect mantel for spring!